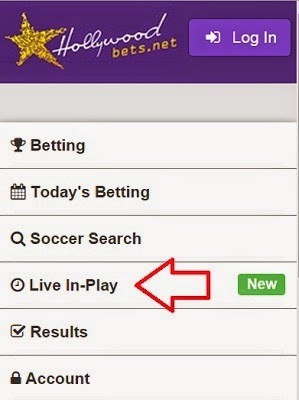 Hollywoodbets Sports Blog: Live In-Play - NEW Hollywoodbets Feature! 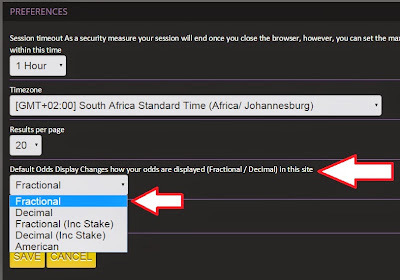 Live In-Play - NEW Hollywoodbets Feature! Hollywood's offering of live in-running betting has just got bigger and better, with the launch our new Live In-Play feature on the Hollywood website and mobi-site! Please note that this feature is not currently available on the mobile app. How do I access the Hollywood Live In-Play betting site? Do I need to do a bank deposit to get money into my Live In-Play balance? How do I get money into my Live In-Play balance? Can I withdraw my winnings from my Live In-Play account straight to my bank account? 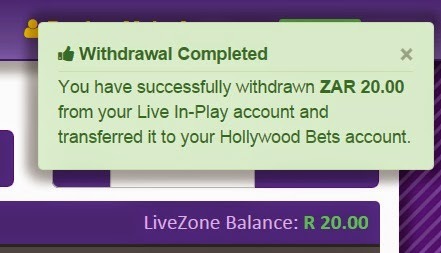 How do I transfer money from my Live In-Play Account back to my Hollywood balance? What are the current live events I can bet on? How do I strike my first bet? Why does my bet not go through immediately when I strike my bet? How do I see my previously struck bets? How do I take multiple Live In-Play bets? 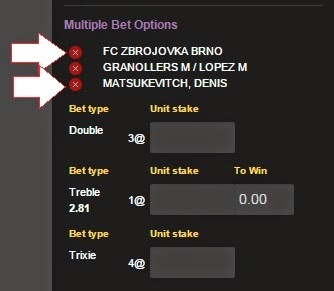 How do I remove a team from my multiple selections (before I strike the bet)? Can I take a multiple with pre-match bets and Live In-Play bets? 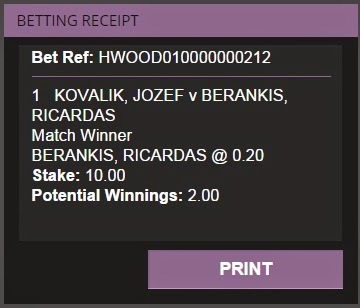 Can I take a multiple with Live In-Play markets within the same match? My odds are currently shown as decimal. How do I change them to fractional? 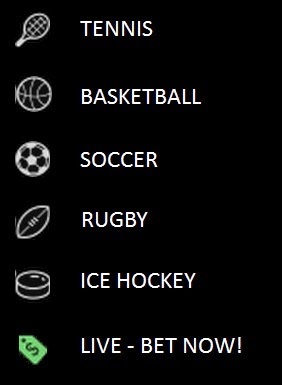 What do the different sport symbols mean on the Live In-Play Diary? If you are on the Hollywood website, click on the "LIVE IN-PLAY" button, which is located at the top of the event browser (on the left hand side of the website). Wait for it to load, and it will redirect you to the Live In-Play site. If you are on the Hollywood mobisite, the 4th button in the menu says "LIVE IN-PLAY". Click this button and it will direct you to the Live In-Play website on your smart phone. If you already have money in your Hollywood account, then you do not need to do any bank transfer or deposits to get money into your Live In-Play account. You can simply transfer money from your Hollywood balance into your Live In-Play balance. Note: Whenever playing Live In-Play, you will need to always first transfer money from your Hollywood balance to your Live In-Play balance. 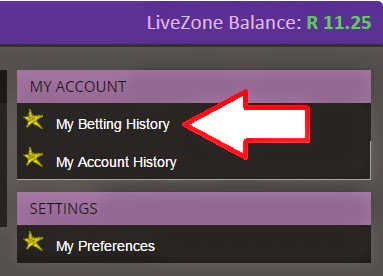 Once you are on the Live In-Play website, you will see your Hollywood balance at the top right hand of the screen, and your Live In-Play balance a little bit lower than that - it is named "Live Zone Balance". These are indicated by the red arrows on the pictures. If you wish to transfer money from your Hollywood account to your Live Zone wallet, you can use one of the four "Transfer" options on the website. These are indicated by the red stars on the picture. Lets show an example using the fourth option - Enter Your Own Amount. The balance for this customer currently shows as R145.76. 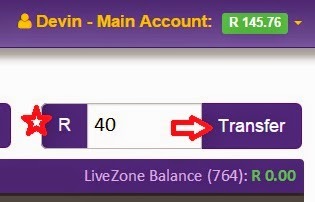 If he wants to transfer R40 into his account, he will type in R40 in the box, and then click "Transfer." You will then get a "Confirm Transfer" box. Click "Continue" to transfer the balance, or cancel. If you click continue, it will then confirm that the balance has been transferred into your Live Zone balance. Your two balances will now be updated. No. You will need to first transfer the money from your Live In-Play account back into your Hollywood balance. Once the money is in your Hollywood balance, you will then be able to follow the normal procedure for withdrawing your funds. To withdraw money from your Live In-Play account, click on the heading "Main Account" in the top right hand corner of the website. This will open a drop down. Click on the button that says "Withdrawal." 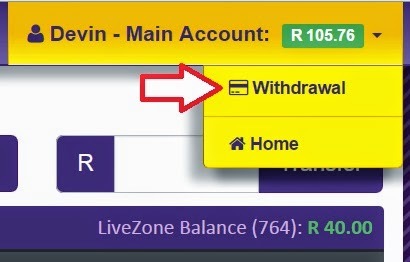 A pop up box will ask how much you wish to withdraw (note the Live Zone balance is R40 here). We type in R20 and click "Continue". You will then get a confirmation saying R20 has been transferred. 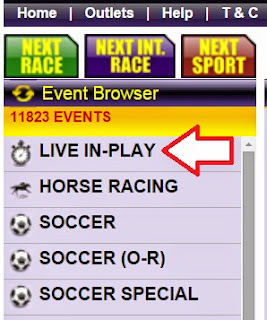 Click on the menu tab on the Live In-Play website that says "Live In-Play". These are the events that are playing right now, and are available to bet on. You can alternatively scroll to the bottom of the page, and look for the heading that shows the events with the Live In-Play title. This will show you all the events. You will have the match title, the sport, the markets, and the starting time. 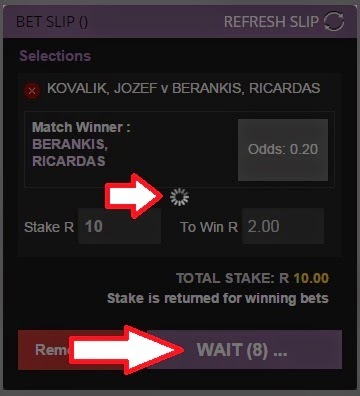 To pick a game to bet on, you can either click on the match title, or the "View Markets" button for that match. What events are the upcoming events available for me to bet on? 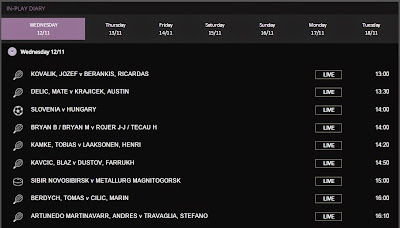 You can see what events Hollywood will be offering Live In-Play betting on by clicking on the "Live Diary" tab on the menu bar. You can see all the upcoming events for the next 7 days*. *Please note that events will be added throughout the week. 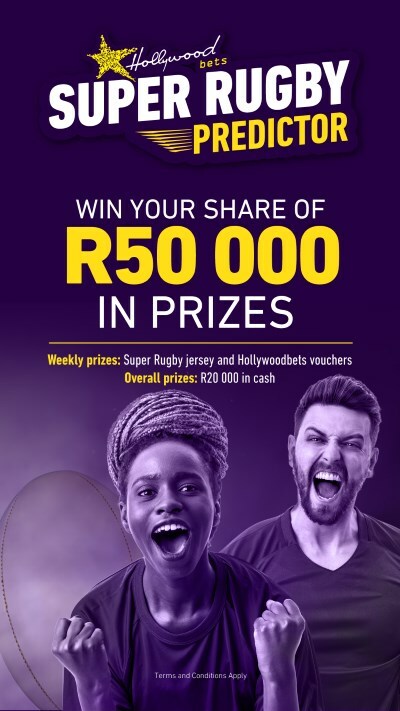 If you want to know if we will be offering live betting on an event that is not being shown, you can email Ricky on richardv@hollywoodbets.net or tweet @Hollywoodbets on Twitter. 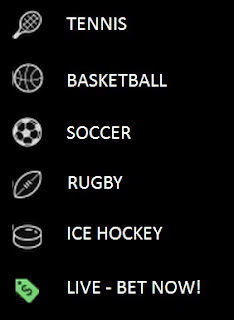 Click on the Live In-Play link, and choose an event you would like to bet on. Click on view markets. All the available markets will come up on your screen. You will see all the market headers on the left hand side of each bet type. You will then see the options to bet on below each header. In the above picture, we decide to bet on BERANKIS, RICARDIS on the "Match Winner" market. All you have to do is just click on the market. This will then add it to your bet slip. Once it is added to your bet slip, you can type in your stake. Here we bet R10. As the price is 0.20, it shows our potential win or "To Win" is R2. Remember that your stake is returned if your bets are winning. Once your are ready, click on the pink "PLACE BET" button. (If you want to remove the bet from your bet slip, click the red "Remove All" button). If the bet does not go through because of a price change, then you will either be shown a new price (which you can accept and bet); or it will show you that the market for that event has now been suspended. If it does go through successfully, then you will be shown a bet confirmation on the bet slip. 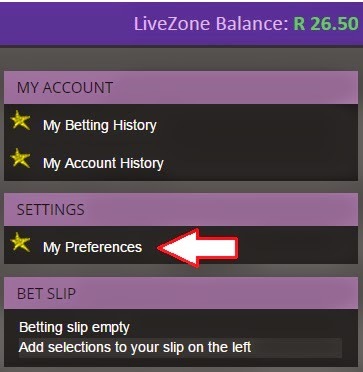 If you want to view all your current pending, winning and losing bets, click on the "My Account" button on the menu tab on the home page. You will now see your most recent bets. The bets show the match, selection, the amount you bet and the current bet status. 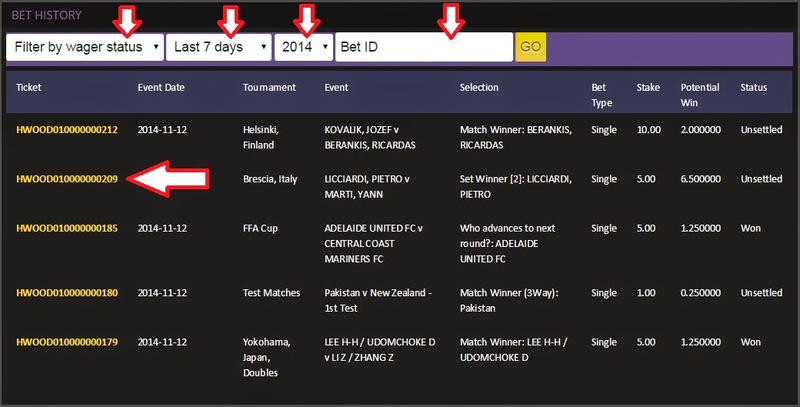 You can filter or search for your bets by bet status, date, year, and bet id search. 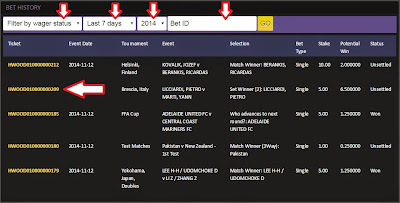 Click on the Ticket number on the left hand column if you wish to view the full details of your bet, or if you wish to put it into a printable format. Taking a multiple with different Live In-Play events is easy. Select the first market you want to bet on by clicking on the price. 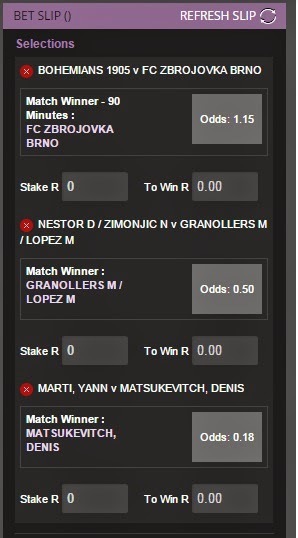 This will add it to your bet slip (which is found on the right hand side of the screen). 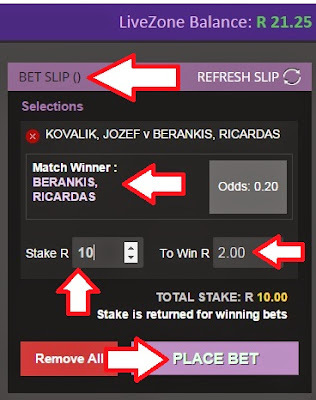 Now click on the Live In-Play link to view the other available Live In-Play matches. View another match, and then click on the market you want to include on your multiple. This will add it to your bet slip. Keep following this procedure until you have all the legs you want to have in your multiple. Note that prices are subject to your change. 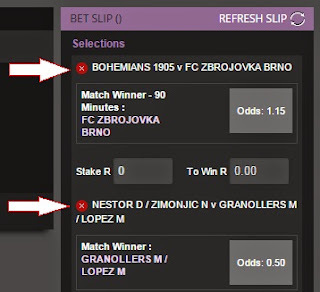 Your bet slip will ask you to accept the new price before submitting. Here is an example of 3 leg multiple on your bet slip. 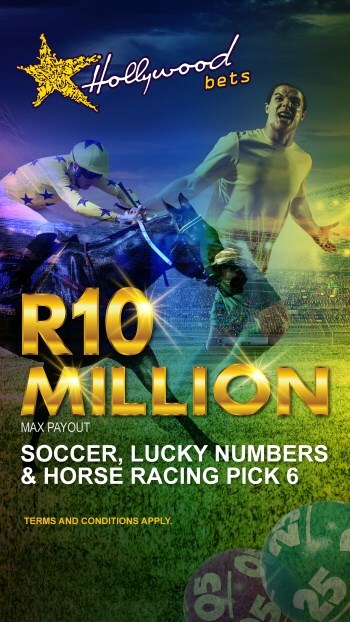 It will cost you a minimum of R1 per bet, meaning this option will cost you a total minimum of R3. If you want R1 per combination, then enter your unit stake as 1. This will cost total R3. If you want R5 per combination, then enter your unit stake as 5. This will cost total R15. Remember if 1 team loses, you still have the chance of winning if the other 2 teams win. 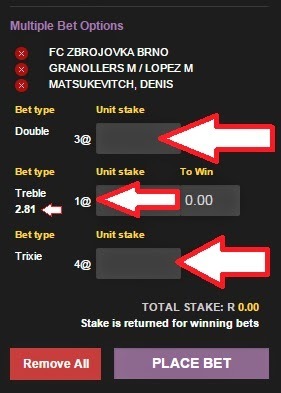 The Treble bet indicates your straight multiple. So here you need all 3 bets to win. Enter your stake that you want. You will see the odds below the word Treble. The "To Win" box will show you how much your stake will win you. Remember your stake is returned if it is a winning bet. 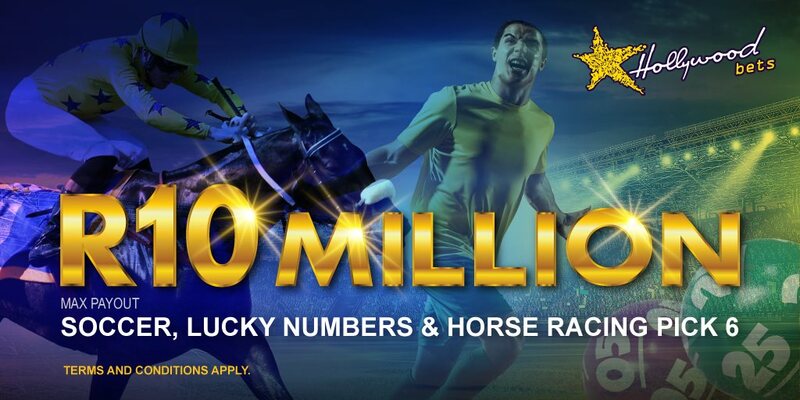 It will cost you a minimum of R1 per bet combination. There are 4 combinations in the Trixie. If you want R1 per combination, then enter your unit stake as 1. This will cost R4. 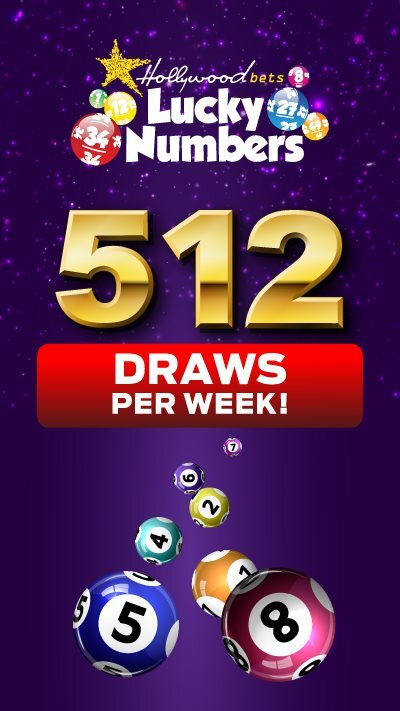 If you want R5 per combination, then enter your unit stake as 5. This will cost R20. If one team loses, you will still have a chance of winning on the remaining double. If you want to remove a selection from your bet slip, just click on the red cross next to the team name. On your multiple selections there is also the option of removing a team by clicking on the red cross. Unfortunately this feature is not available at present. You can only take Live In-Play multiples with Live In-Play events. If you wish to take pre-match multiples, please return to the main Hollywood website. No you cannot do this. This is regarded as a "related" bet, as one outcome directly affects the other. 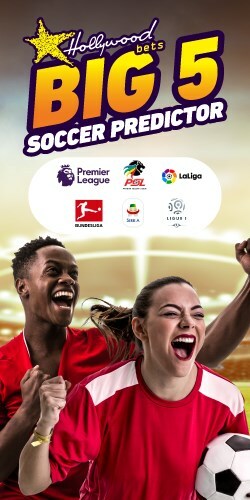 Any bet that is processed will follow the related bet ruling, which says that the bets will be seperated, and the stake divided amongst the legs. You need to go to "My Preferences" on the Live In-Play Zone in order to change your odds view. Click on the My Account link on the Menu tab. Then click on "My Preferences" on the far right hand side, just below your balance. Go to the 4th option on the drop down menu. You will see there is a drop down menu to change how your odds are displayed. Click on Fractional (if you want to change from decimal) and then click SAVE at the bottom of the screen. You can change this at any time. 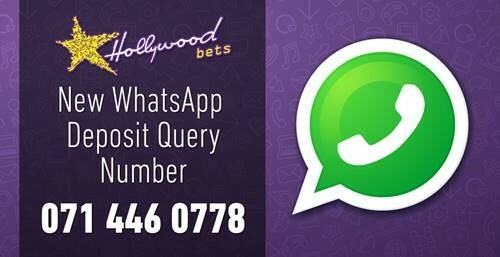 Open an account with Hollywoodbets.net now! Click here to Register Now!